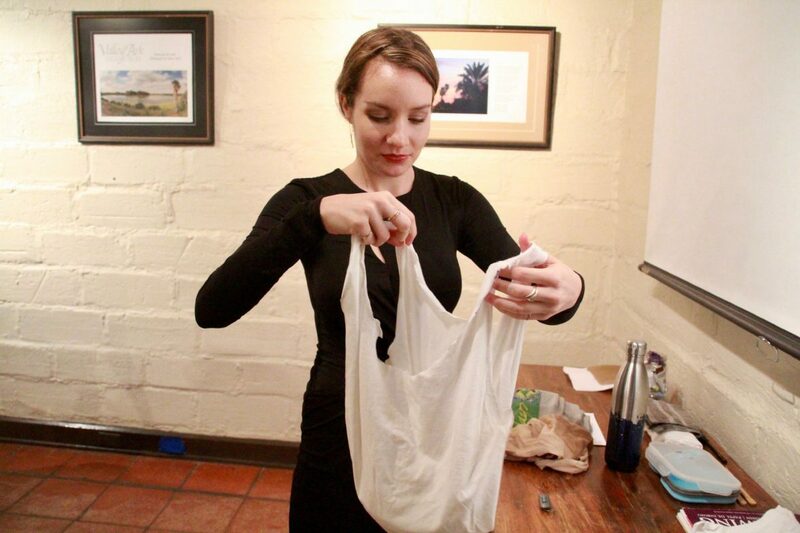 Carly Tencza, a nature educator at Quinta Mazatlán, demonstrates how she made a reusable cotton bag for groceries out of an old T-shirt on Sept. 6, 2018. McALLEN — Which is more sustainable — paper, plastic or a reusable bag? Carly Tencza, a nature educator at Quinta Mazatlán, asked the question Thursday during her presentation titled “Living Green: Three Simple Steps,” which was the first of the 2018 Quinta Mazatlán Fall Speaker Series. Paper bags are made of trees, which she explained takes up a lot of resources to produce. Reusable bags are better, but they’re usually made of plastic and are difficult to clean. She suggests using a cotton bag, preferably one made out of an old T-shirt. Throughout her presentation she showed the audience how to take on sustainability dilemmas such as the former, and explained how things most people normally overlook can make a huge difference for the environment. 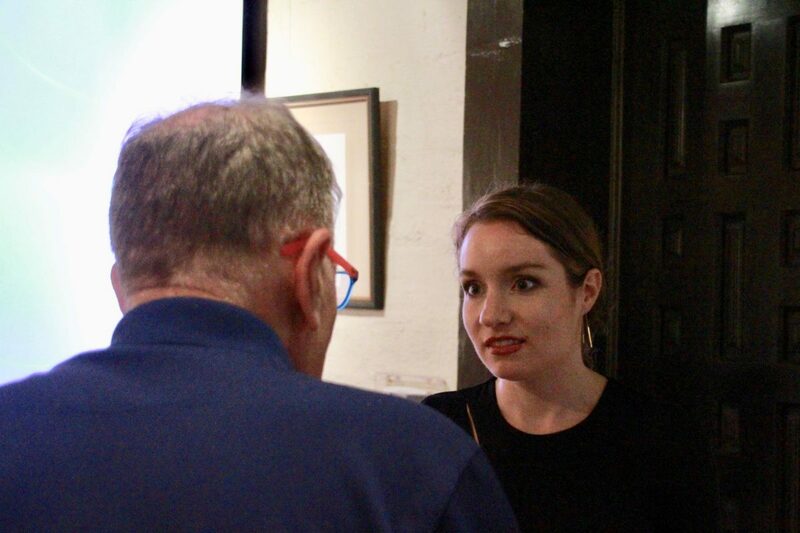 Carly Tencza, a nature educator at Quinta Mazatlan, talks to one of the attendees of her presentation "Living Green: Three Simple Steps," on Sept. 6, 2018. 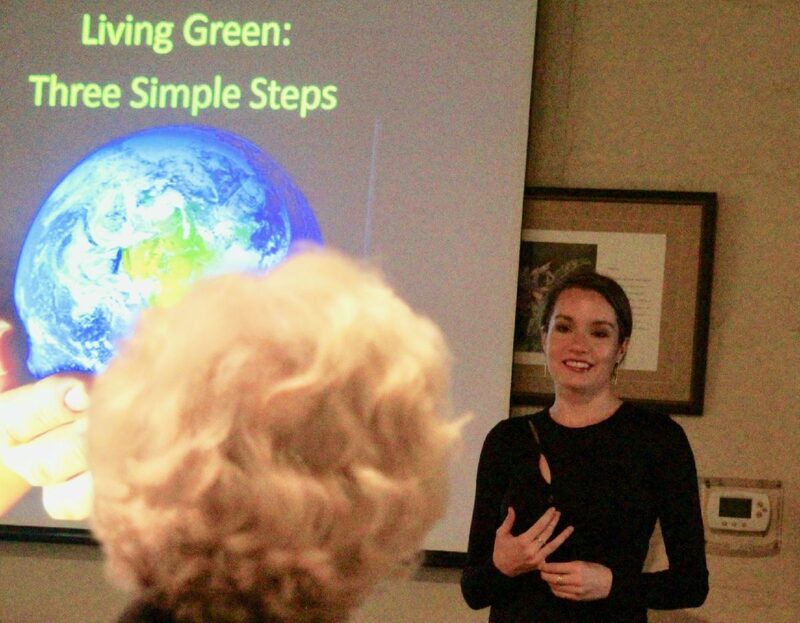 Carly Tencza, a nature educator at Quinta Mazatlan, gives a presentation titled "Living Green: Three Simple Steps," on Sept. 6, 2018. She admits sustainability is complex, and when asking yourself those questions, it might be best to look at nature as an example. “In a way, nature is a zero-waste economy,” Tencza said. She added that in America, we’ve become a “throw-away” society. Consumerism brings us to buy disposable items instead of reusable ones, and to throw things away when they get old instead of refurbishing them, she said. It’s important to think about how long our waste will remain in the ground. “All those red Solo cups we may have drank out of in college? Those are still around,” Tencza said, admitting that the cliff bar she had earlier that day will also stay on the planet for hundreds of years. This is at least the fourth year Quinta Mazatlán hosts the Fall Speaker Series, and since the series began, the types of events and speakers featured has changed. This year there are cooking demos and a folk healing class. Each presentation lasts 45 minutes with a 15-minute question-and-answer portion. For more information on Quinta Mazatlán, visit: www.quintaMazatlan.com.